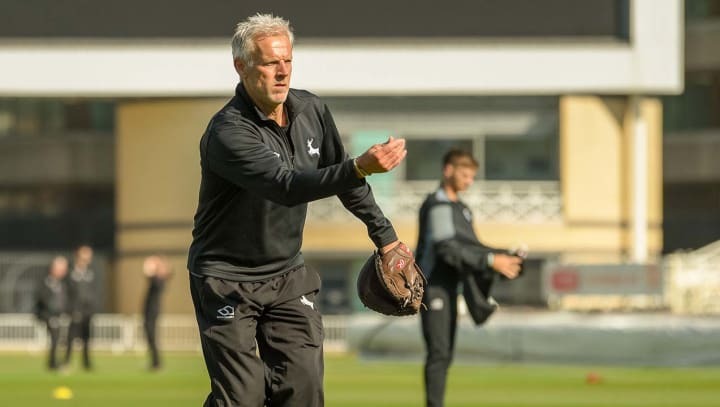 Peter Moores believes Nottinghamshire are ‘in good shape’ for the challenges to come as they prepare to welcome Somerset in the second half of a season-opening double-header at Trent Bridge. Notts have had just two days’ rest since the end of their previous fixture, but the Head Coach does not feel this will be an issue at such an early stage of the season. “One of the bonuses of the last game petering out to a draw on the last day was that we could save our bowlers a little bit towards the end,” said Moores. The visitors secured a comfortable victory at Trent Bridge towards the end of last season, but Moores’ much-changed side acquitted themselves well in the opening fixture of 2019, having much the better of a draw with Yorkshire. “I don’t think we need to change anything, we just have to keep playing that standard of cricket and be as excited about this game as we were the first one, that’s our biggest challenge," said Moores. “Somerset are a good team and they played some top cricket last year. Lewis Gregory starred for the West Country side in their battling victory over Kent in the opening game of the season, taking 5-18 as Somerset routed their opponents for 131. But Moores is aware of the threats that run all the way through the side which finished runners-up last season. “I don’t think we will pick out any one player on their side, we’ll just look to play good cricket and like most of the time we’ll concentrate on ourselves and less on the opposition," he said. Notts dominated their opening Championship fixture against Yorkshire before Joe Root and Gary Ballance secured a final-day draw for the visitors. Joe Clarke turned in a star performance with the bat, scoring over 200 runs in the game and being ably supported by Ben Slater, Ben Duckett, Paul Coughlin and Chris Nash. The home side’s bowling attack also performed well, with wickets shared between Stuart Broad, Jake Ball, Luke Fletcher and Samit Patel. “As a batting unit, we’re very happy,” said Moores. “Stuart Broad and Luke Fletcher really stepped up in the first innings, and in the second innings Jake Ball was probably the pick of the bowlers in the second innings. Having Paul Coughlin back in the team is exciting as well. Nottinghamshire have named a 13-man squad to face Somerset, with Luke Wood returning from his loan spell with Northamptonshire and Zak Chappell making his first appearance in a Notts County Championship squad. Paul Coughlin has a finger injury and Matt Carter is continuing his return from injury, while James Pattinson’s stint with the county begins after this fixture.